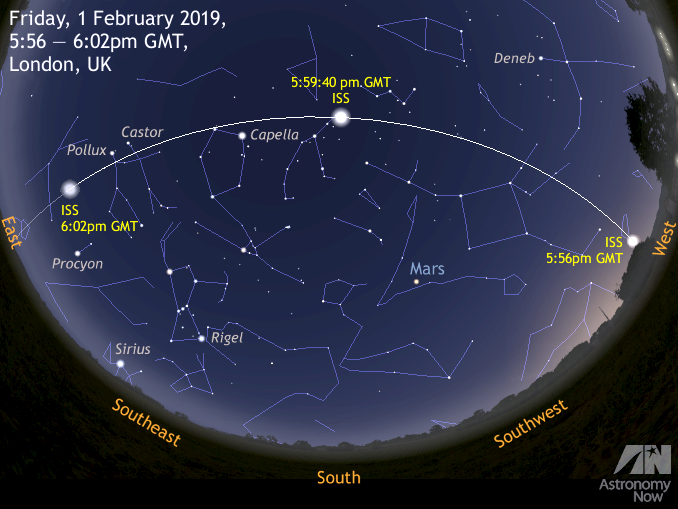 Stargazers in the south of England with a clear sky from 5:56pm to 6:02pm GMT on Friday, 1 February saw a particularly favourable pass of the International Space Station. The first week of February provides several opportunities to see the spacecraft, so be sure to use our online Almanac to generate predictions for where you live. The following article shows you how to do that. AN graphic by Ade Ashford. Urban dwellers may resign themselves to spotting just the Moon, prominent planets and the brightest stars with the unaided eye through the streetlight glare on what passes for a clear night, but every so often a dazzling artificial satellite will catch your attention as it glides silently across the sky. The largest man-made structure in orbit is the 450-tonne International Space Station (ISS), a satellite so big — 73 × 109 × 20 metres — that it can be seen from the most light-polluted town or city. Fortunately for us, its current orbit carries it over the British Isles and Western Europe for the next few nights, appearing like a slowly moving bright ‘star’ occasionally rivalling Venus in brightness, crossing the sky in an arc from west to east. The International Space Station on 23 May 2010 as seen from the departing Space Shuttle Atlantis during STS-132. Image credit: NASA/Crew of STS-132/Wikimedia Commons. 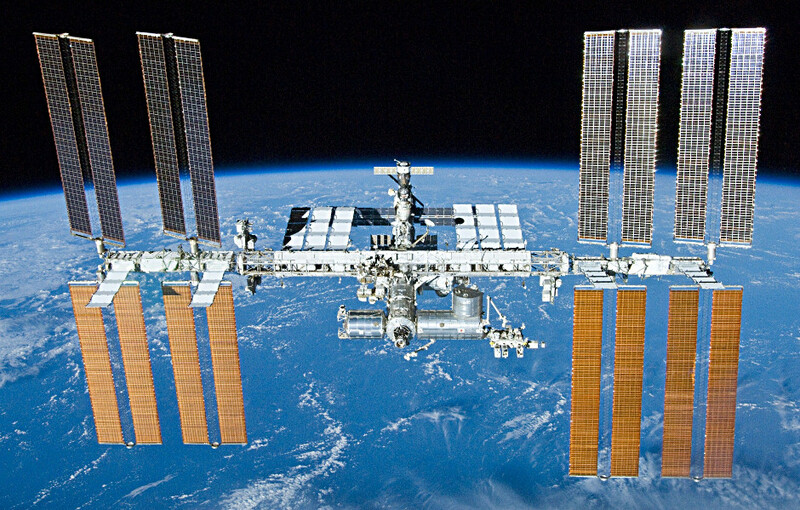 The International Space Station orbits the Earth every 92.7 minutes at an altitude between 404 and 411 kilometres, travelling at an average speed of 27,500 kilometres per hour (7.6 kilometres per second). The ISS orbits our planet with an inclination to the equator of 51.6 degrees, meaning that it can appear overhead at all latitudes between 51.6° N and 51.6° S. As far as the UK is concerned, the ISS can be seen as high as the zenith at all locations south of a line drawn between Swansea and London, appearing lower in the sky for all places north of this line. Many of you may have used our online Almanac to obtain information about lunar phases, or the rising and setting of the Sun, Moon and planets for wherever you may live, but the Almanac can also tell you when and where to see the International Space Station. In the Almanac, select the closest city to your location from the Country and City pull-down menus before ensuring that the box beside Add ISS passes? has a tick in it. The UK uses GMT in January, so the Daylight Savings Time? box should be unchecked. The table underneath the Moon phase data then shows nighttime passes of the International Space Station over your chosen location during the next few days, if any. Here is a recent example computed for Cardiff: For the given Date in year/month/day format, Local Time is the instant the ISS first becomes visible and Duration indicates the length of the sighting in minutes. At the given Local Time, look in the direction indicated by Approach and, weather permitting, you should see the ISS as a slowly moving, bright “star”. Max. elevation is how high the Station will get above your horizon (90° is overhead, while 20° is about the span of an outstretched hand at arm’s length) and Departure indicates where the ISS will be when it vanishes from sight. Sometimes an appearance or disappearance occurs well up in the sky when the Station emerges into sunlight or slips into Earth’s shadow, respectively. In the example above, as seen from the Welsh capital on the evening of Wednesday, 30 January, the ISS first appeared 18° (twice the span of a fist at arm’s length) above the west-southwest (WSW) horizon at 6:02pm in a viewing window lasting four minutes. 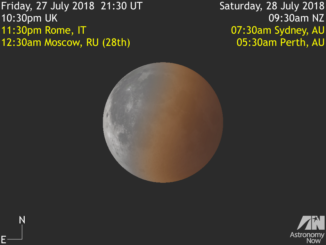 It attained a peak altitude of 66° above the southwest (SW) horizon before fading into Earth’s shadow 27° above the eastern (E) horizon around 6:06pm (all times GMT). Important note: the precise timing of an ISS pass is highly location specific, plus the orbit of the spacecraft is subject to change due to periodic boosts to a higher orbit or to avoid debris, hence predictions made on the day are more accurate. In this image we see the young lunar crescent as seen from the International Space Station by ESA astronaut Tim Peake on 9 February 2016. At the time of the photograph the Moon was just 1.2 days old. Features on the Earth-facing side of the Moon not directly illuminated by the Sun are glowing softly due to earthshine, light reflected onto the Moon from our planet. Mercury is currently putting on a fine show in the east before dawn. Find a UK location with an unobstructed view due east an hour before sunrise to see the innermost planet some 6 degrees above the horizon from about 25 September—5 October. 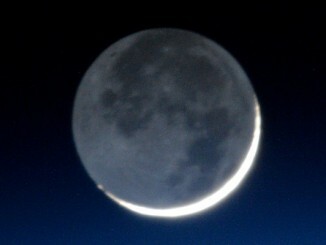 The very old crescent Moon lies just 2 degrees from Mercury at dawn on Thursday, 29 September.